USADA announced today that an independent arbitration panel issued its written decision upholding the finding that judo athlete, Joshua O’Neil, committed a doping violation and will receive a two-year suspension for the offense. O’Neil, 24, of of Hawthorn Wood, Ill., tested positive for ritalinic acid (Ritalin), a stimulant, as a result of a urine sample collected at the U.S. Senior Judo National Championships on April 18, 2009. Ritalinic acid, a metabolite of methylphenidate, is listed as a Specified Substance and is prohibited under the USADA Protocol for Olympic and Paralympic Movement Testing and the International Judo Federation Anti-Doping Rules, both of which have adopted the World Anti-Doping Code and the WADA Prohibited List. 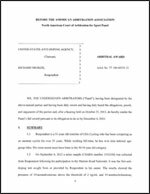 The independent panel of arbitrators from the American Arbitration Association (AAA)/North American Court of Arbitration for Sport (CAS) wrote that O’Neil also did not meet the burden of proof to have his sentence reduced under Article 10.4 (Elimination or Reduction of Ineligibility for Specified Substances under Specific Circumstances) of the World-Anti Doping Code (WADC) or Article 10.5.2 (No significant Fault or Negligence) that the concept of proportionality should apply. O’Neil had argued that a reduced sentence should apply because the substance was consumed to help study for an exam, and not for athletic performance. Ritalin has previously been used as an appetite suppressant and as a result can aid athletes in the sport of Judo in which participants must meet weight-class requirements for competition. The court did find that O’Neil’s sanction should commence April 18, 2009, the day his urine sample was collected. As a result of the doping violation, O’Neil has been disqualified from all competitive results achieved on the date of his positive test, through and including the completion of his two-year sanction.